We try and keep our designs looking as clean and simple as possible regardless of how complex the site gets. One of the most important considerations is the site's navigation. No matter how large a web site is you should always know where you are within the site, poor navigation will confuse anybody browsing the site which could result in them getting lost and they may leave prematurely, which is not productive. We like to keep the navigation clear and concise, with text perfectly visible and readable. 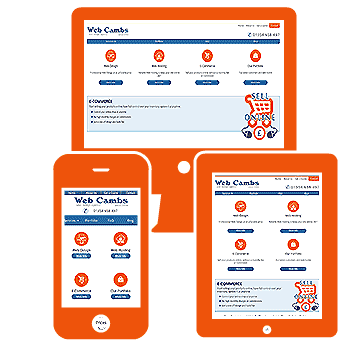 All of our web sites are tested on different screen sizes, platforms and mobile devices as everyone uses something different. Some website designs especially from free CMS (Content Management Systems) employ too much technology that is not always needed. This leads to a larger download time and bloated coding which can result in a site that runs inefficiently. Designing your site around your intended audience can have a dramatic improvement on site performance. We only deploy technology that is actually being used to maximise efficiency. Even with the roll out of faster Broadband and mobile data, a website's loading time is still as important as ever. The average user will only wait around 6-10 seconds for a site to load. It is vital that a site is optimised to aide faster loading times, such as compressing images, using the correct formats, minimal code and maximising resources. When we design a web site we take all the factors into account and construct a site based on the clients ideas while keeping a focus on the target audience, this is then all put together with our professional experience and technical knowledge.